This weekend it was the Gallarte Exposition. For those who don´t follow my other blog, Gallarte is a small group of artists and crafters from my village, Los Gallardos, and the surrounding area. We have two expos a year, one at Easter and the other at Christmas time. 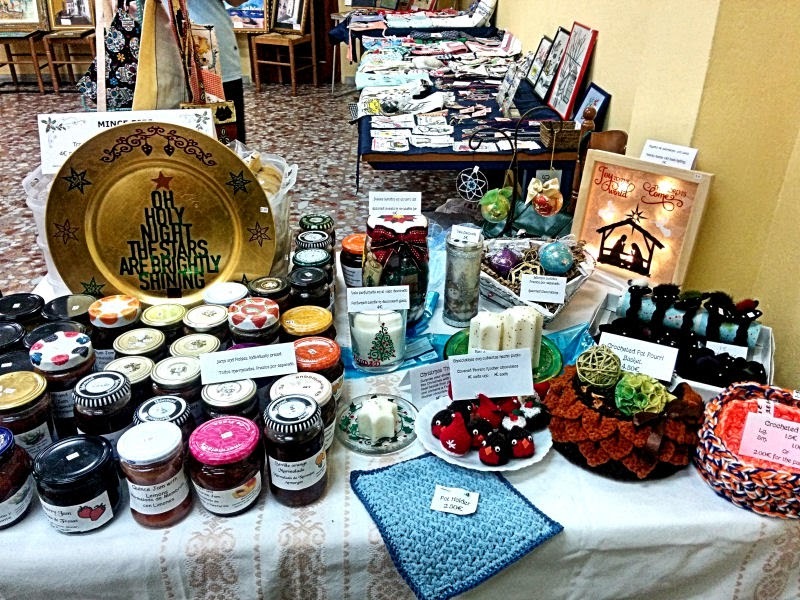 I try to have a small table selling mainly mince-pies and jams and pickles at this time of year, with a few bits of craft as well. I sold quite a bit at my friend´s coffee morning for the church, back in November, so I needed to do a few more quick makes for this weekend. I knew the visitors to the sale would mostly be the Spanish folk from the village, and they don´t do Christmas decorations like we do, but they do like candles. So when I was walking around the ´Todo´shop looking for items to decorate, I picked up a green candle plate, and also another small clear one. 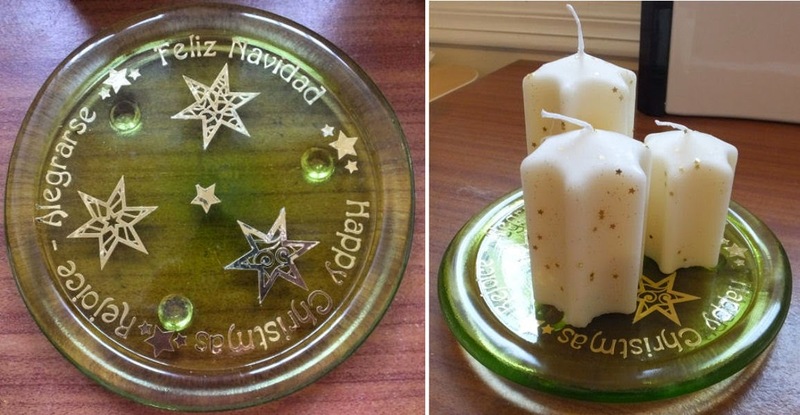 In Lidls recently I bought a set of star shaped candles with tiny glitter stars all over them, so for my plate I designed a layout using stars and some greetings in both Spanish and English. I cut them from some gold metallic vinyl, using my silhouette cameo, and arranged three of the candles on it. There was a fourth very short candle that I put on the smaller plate, which I had already decorated in the same way as I did last time. My other purchase from the todo shop was a lovely big glass jar with a screw top lid. I spent ages deciding how to decorate it, but in the end I settled on two ornate frames, one for each side, with an English greeting in one, and a Spanish greeting in the other. Then I collected up lots of small Christmas cutting files from my Silhouette library, and cut them is several colours of vinyl, which made good use of some my tiny snippets. I never throw any vinyl away; it is far too precious because I have to import it and it is heavy, so expensive to post; so I keep every tiny bit and use them for these little cuts. To finish off my jar I cut a four layer poinsettia to cover the lid, and tied a big bow around it, using my hot gun to hold it in place. For the photos I put a roll of white copy paper inside the jar, but it has still picked up some odd reflections. But for the sale I filled it with the traditional marzipan sweets, and ground nut biscuits that are the traditional Christmas fare out here. My other new make, was something I have wanted to try for a long time. When I was on holiday in UK, back in the spring, my sister took me to The Range, a shop I could spend hours browsing round! One thing I bought there was a shadow frame, the sort that have a deep back for arranging dried flowers etc in. I fitted a sheet of vellum with a very pale pattern on it, behind the glass, and arranged a string of ten LED lights in the recess behind this. (Battery operated, and a great find in Lidls a few weeks ago). Then I used vinyl to cut a nativity scene in black, two white angels, and a sentiment in red. The sentiment file was all joined into one piece, so I had to separate it and rearrange it to make two pieces - you know how I like everything to be balanced! Then I grouped it all together and resized it to fit on the front of the glass. I was pleased with this and I would have been happy to display it at home if it didn´t sell, but it did, and that is what I made it for. I now know that I can buy these frames at IKEA but that is nearly two hours drive from here, so I am not likely to get there again before Christmas. But maybe by next year, I will have made another one for me. I forgot to photograph this when it was finished so this one was cropped from my photo of my stall. Here is what my whole table looked like. On the wall beside my table, I also displayed the photographs I prepared for the photo club exhibition last month, and I sold two of them! I didn´t expect that! It was a good sale for me. I took around 100€ which is double what I usually make. I keep my prices as low as I can, because I know there is very little money around, and the local folk are looking for inexpensive gifts for family and friends, so I aim to cover my costs, and just ´fund my hobby´, so I am well satisfied with this weekend. All of these used up little pieces of vinyl, especially the sweet jar, so I shall link up with Pixie´s Snippets Playground. Well done on funding your hobby so efficiently :-). Love your light box nativity!! What a wonderful display and you should be so proud that it is all your work to benefit others.So worthwhile and I am really happy for you that you did so well. 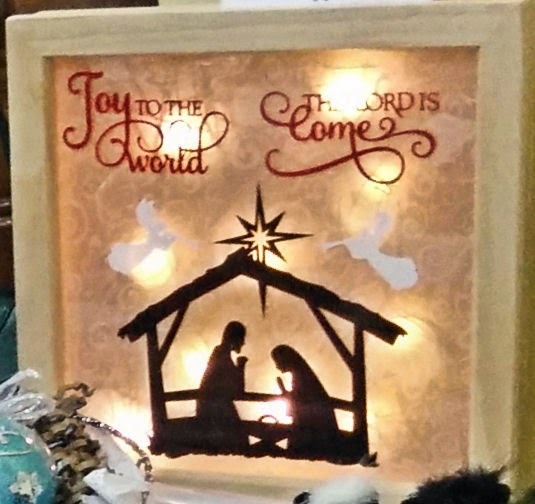 I love how your nativity light box turned out. Glad you did so well at the expo too, well done. Oh Kate, your table looks stunning. Love all the things you showed - most of all the beautiful Nativity light box - it's gorgeous! Sorry I'm a bit late calling by, not supposed to be peering at laptop really but wanted to just check that the Playground hasn't been overrun by naughty elves!! Great makes there Kate. I do love a good Nativity scene.